Unclogs Pores to Reveal Softer and Smoother Skin. Himalaya's Deep Cleansing Apricot Face Wash gently removes dead skin cells, eliminates blackheads and prevents acne from recurring. Enriched with the goodness of Red Lentil, Apricot granules, Lemon and Honey, the face wash leaves your skin deeply cleansed and moisturized. Apricot granules gently scrub off dead skin cells, help stimulate fresh cell growth, and prevent the formation of blackheads. Neem and Lemon deep cleanse and remove excess oil, while Aloe Vera soothes your skin and helps maintain its natural moisture balance, leaving your skin fresh, rejuvenated and glowing, day after day. 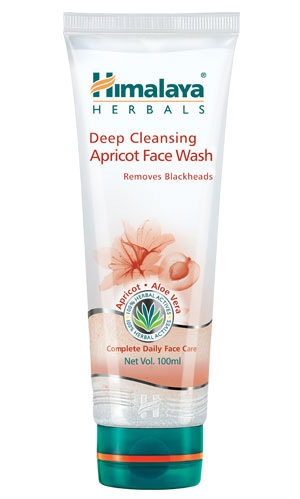 Moisten face and massage Deep Cleansing Apricot Face Wash all over, avoiding the delicate eye area. Wash off and pat dry.